Who knew this could really happen?!?! When the Olympics began in 1896 women were banned from participating. One of the reasons was because it was thought women were not physiologically capable of running because her uterus would fall out. Well apparently there is some truth to that matter. It can happen. In fact it did happen. A couple weeks before my Ironman 70.3 I went out with a friend for an easy paced 12 mile run. I was very uncomfortable. My stomach was cramping so bad it hurt even in my lower back. I had a lot of pressure on my bladder. In retrospect, it felt a lot like labor. After running 12 miles I ended up walking a mile back to my house. It was a very uncomfortable walk. When I got home it was obvious something was very wrong. The doctor informed me I had a prolapse. My uterus fell and my cervix was out rather than in. I was diagnosed with uterine prolapse, cystocele, and rectocele. I was so concerned of course that this would interfere with my race. Fortunately I have an amazing and understanding Doctor. He put everything back in its place and gave me a way to be able to do my race. Wow! Ok that sounds a little crazy even to me. Lol. But I am so grateful I was able to do it. The doctor informed me that this happening was due to a culmination of things - having four children in under six years, age, and intense training. I had been informed that after the race I would need surgical repair. 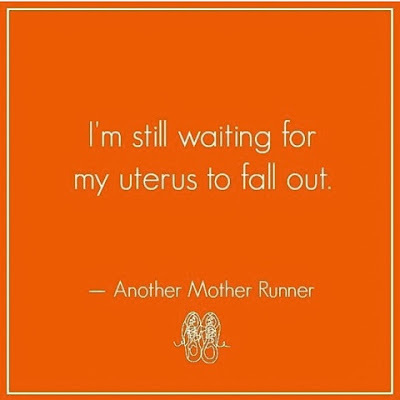 So when I went back to the doctor post race, I learned I would need a hysterectomy, anterior repair, posterior repair, and a sling insertion. I was told my recovery would be at least six weeks of no physical activity whatsoever. Now I've been sidelined with injury and I fight RA every day, but I don't sit still. I always find a way to be active. This is going to be quite a challenge. Whoa! I'd like to be all philosophical about getting stronger and stuff, but my first reaction is just to say that it really stinks that you're going through this! I feel really bad for you. Six weeks with no exercise is going to feel like a long time, I'm sure. I'll think good thoughts for you. Is there anything you need from NYC? Wow Jill. I'm so glad I came to read tonight. I've heard of a prolapsed uterus but I think a lot of people dismiss it as being a wives tale. Childbirth does quite a number on us!! I look forward to reading more about your journey, and I'm glad that you are taking things one step at a time now. Sending up healing prayers .